This is just about the most famous Rajasthani/Marwari dish. The spicy dal (lentils) and sweet churma make the perfect balanced meal and taste great eaten with baati (deep-fried unleavened bread). It is a delicious side dish made from yoghurt, gram flour and spices. It is similar in consistency to kadhi from other states like Maharashtra but is much spicier. It is a light and healthy Rajasthani dish that goes well with rice. Methi bajra pooris make a great starter for any event. They are basically deep-fried puffed bread made with fenugreek leaves and millet flour. They don’t absorb much oil and are healthy! Gatte refers to besan (gram-flour) dumplings. The dish is made by stuffing the dumplings with mawa and dry fruits, and then dipping it in a rich yoghurt gravy. This dish is a delectable combination of berries and beans. It is essentially a traditional Rajasthani sabzi that’s made with ker berry and sangria bean. It is spicy and can be eaten as a pickle. This is another delicious Rajasthani or Marwari dish that can be eaten as a main. It is also called Gatte Ki Khichdi or Ram Pulao. The gatta, as mentioned earlier is made from besan (gram/chick-pea flour) and added to rice along with select seasonings. Tastes best with chilled yoghurt/curd. This is essentially a meat curry. It is a Rajasthani dish that is prepared with mutton in a spicy gravy of curd, spices like red chillies, garlic and other flavours. It is as spicy as it is delicious! Eaten best with bajra roti. This is an exotic Marwari dessert from Rajasthan. It is a sort of puffed pastry that is deep-fried, filled with mawa and dry fruits, and coated with sugar syrup. This one is yet another festive, traditional Marwari/Rajasthani dish. A dessert comprising of a disc-shaped sweet cake soaked in sugar syrup. It has different varieties such as plain ghevar, malai ghevar and mawa ghevar. 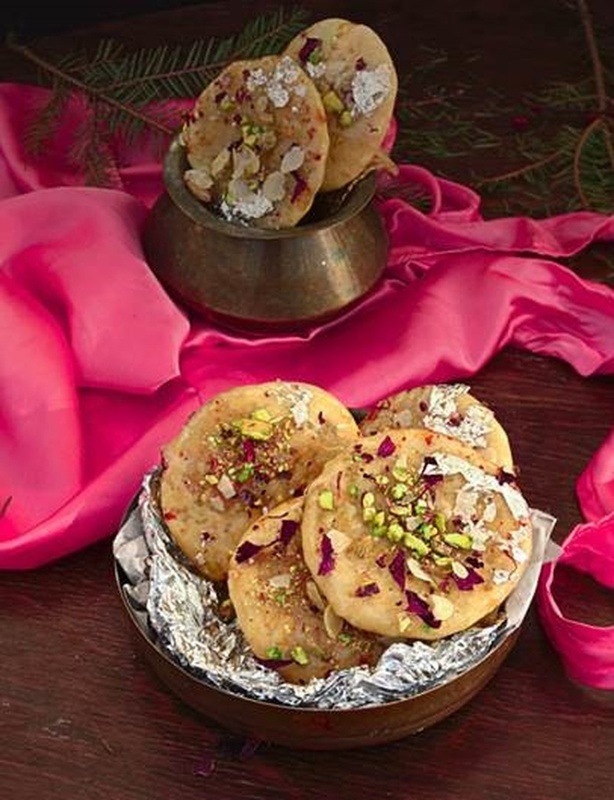 This Rajasthani dessert is similar to a doughnut in shape but different in taste and texture. They are crunchy and deep-fried, made from maida-flour, and coated in sugar syrup along with select toppings. Perfect endings to any festive meal.